At Tarek Atrissi Design, we have been for very long the biggest admires of the work of the late Egyptian designer and graphic artist Muhyeddine Al Labbad. 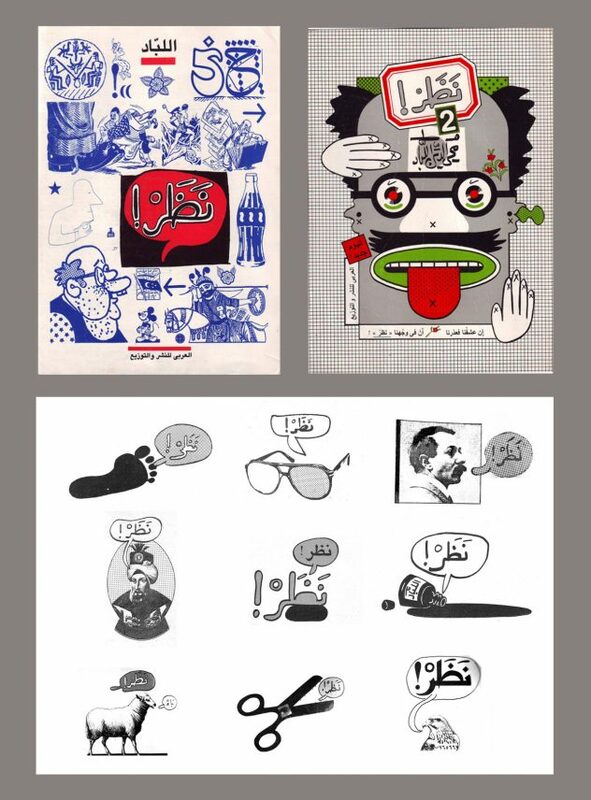 For years, we have researched, collected, studied and analysed his work, and always showcased him as a key influential figure in the history of Arabic graphic design. Al-Labbad was a visionary designer, who was certainly ahead of his time in his practical and theoretical work. 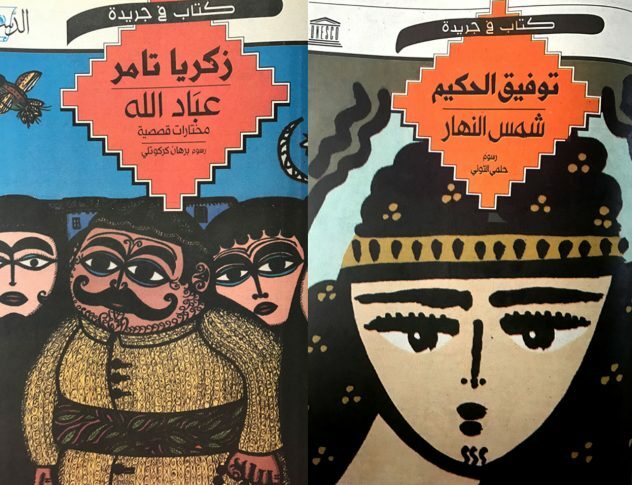 Born in 1940 in Cairo, Al-Labbad was mostly recognised for his illustration work in magazines and newspapers, as well as children publications, but a deeper look into his career and work reveals his core talent as a graphic designer, typographer and art director. 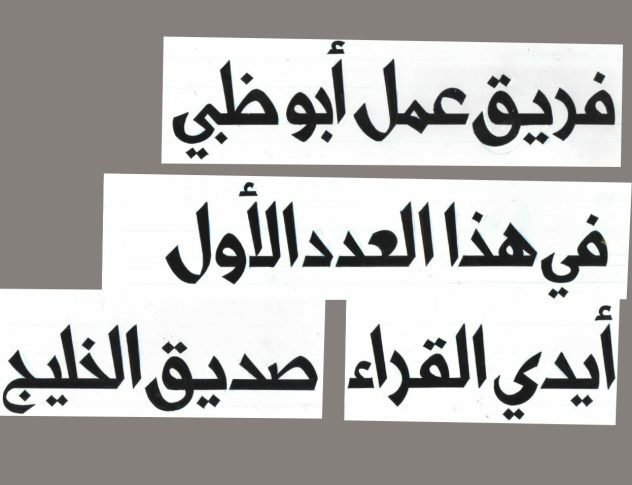 Al-Labbad’s signature lettering, an example of his delicate typographic skills. Probably one of the best projects that embodies the approach and multidisciplinary work of Muhyeddine Al Labbad is the publication he authored and created, Nazar. Getting our hands on a copy of all 4 issues of this unique publication provided us with an enriching in-depth understanding of the visionary work of Al-Labbad and of his analytical design thinking. Nazar was a compilations of short articles Al-Laddad has written about various design topics. His writings focused on different themes in visual communication, Arabic calligraphy, typography, branding, history and design criticism. He explored subjects and case studies in the graphic design field that were rather unaddressed in a young profession in the region, and provided with it a great documentation of history of design in the 80s and 90s. Content aside, The identity and design of Nazar was in itself a strong case study of a branding with an innovative dynamic system, and the cover designs of each issue was a showcase of the design and illustration abilities of a talented designer. Nazar article showcasing some of the sketches and experiments from projects Al-Labbad directed or worked on in Arabic type design. One of the articles that captured our interest in Nazar was a case study of a typographic project that Muhyeddine Al-Labbad has conceived and art directed for the monthly publication “kitab fi Jareeda”, a unesco project that aimed at supporting reading in the Arab world through the publication of a cultural insert in daily newspapers across the entire Arab world. 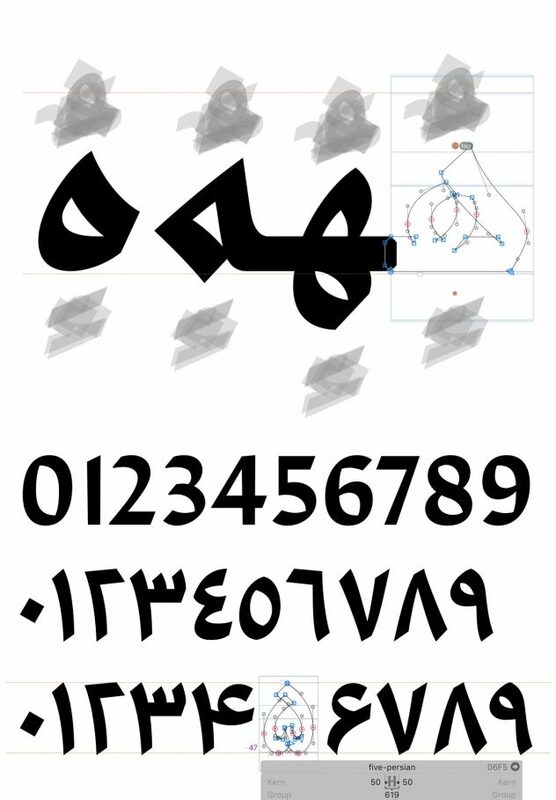 As the creative director of the publication, Al-Labbad worked on developing a couple of headline typefaces to be used for “Kitab fi Jareeda”, in collaboration with Calligrapher Mamoun Ahmad, who worked on drawing the basis of the letters, and programmer Osama Bahr , who developed the font using fontographer, the type design tool of the time. Al-Labbad brought his twenty years of experience in experimenting and working with Arabic typography to add to the project. The beauty and unique personality of the created Arabic typefaces was fascinating. 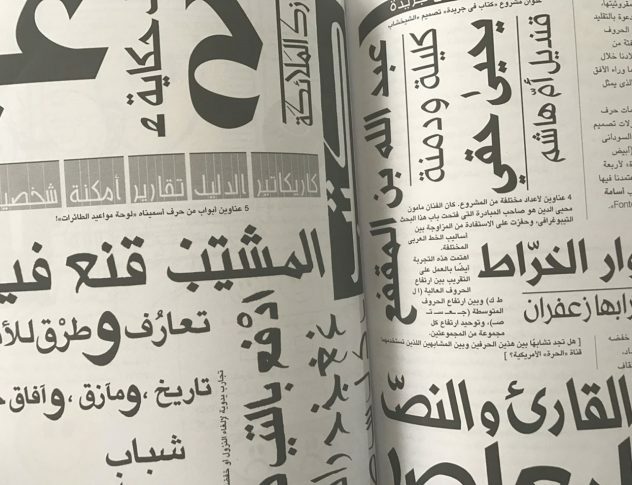 We were particularly intrigued at Tarek Atrissi Design by one of the main headline fonts created, and researched it further by getting all the copies of Kitab fi Jareeda publications to look at it in more details. The font was based on a hybrid design of the “Naskh” calligraphic style and the “kufi al masahif” calligraphic style. The font style had a subtle character and striking legibility, and presented an Arabic font style that is distinct from the available arabic fonts available at the time, and even in the market today, due to its unique fusion of different calligraphic traditional styles. We were immediately interested in undertaking a self initiated project where we could explore experimenting and developing further this typeface, because we saw it a great potential to fill a niche in the available Arabic typefaces nowadays: an opportunity to experiment in reviving and developing this style to further to create an extended type family that responds to the design and technological needs of Arabic typography today. With the goal of celebrating the work of Muhyeddine Al-Labbad and legacy, we have aimed at reviving this typeface by taking a new approach of redesigning it: Redrawing it in a more polished and complete way while trying to maintain its overall character; digitising it properly and developing it into a complete family; expanding its character set to be fully functional in Arabic and Farsi, and further work on designing a latin matching typeface to make it a multilingual font. The process of design started by manually creating new calligraphic artwork samples inspired the style of the font, and eventually compared to scans and digital redrawing based on the newspaper print, resulting of final design decisions in designing the key components. 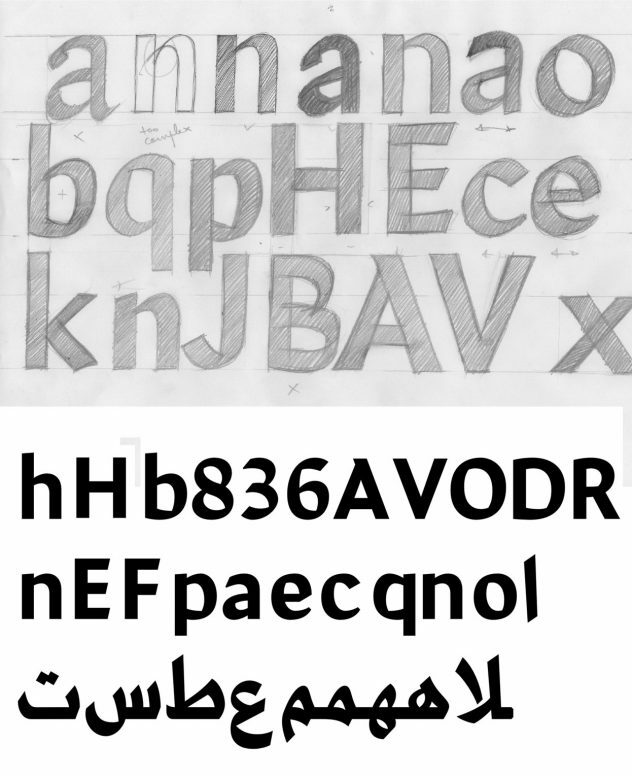 Trials and experiments with the weights of the font defined finally the family of 4 weights for the typeface, and an expanded character set was developed, kicking off as well the design process of the latin typeface, which was based on the characteristics of calligraphic strokes of the Arabic letterforms. The interest from the new daily Al-Itihad newspaper in Lebanon to adopt the typeface for its headlines and pullout quotes gave us a great opportunity to continue refining the design of the font to be optimised for best legibility in the context of Arabic newspaper design, working in close collaboration with the design team at the newspaper. 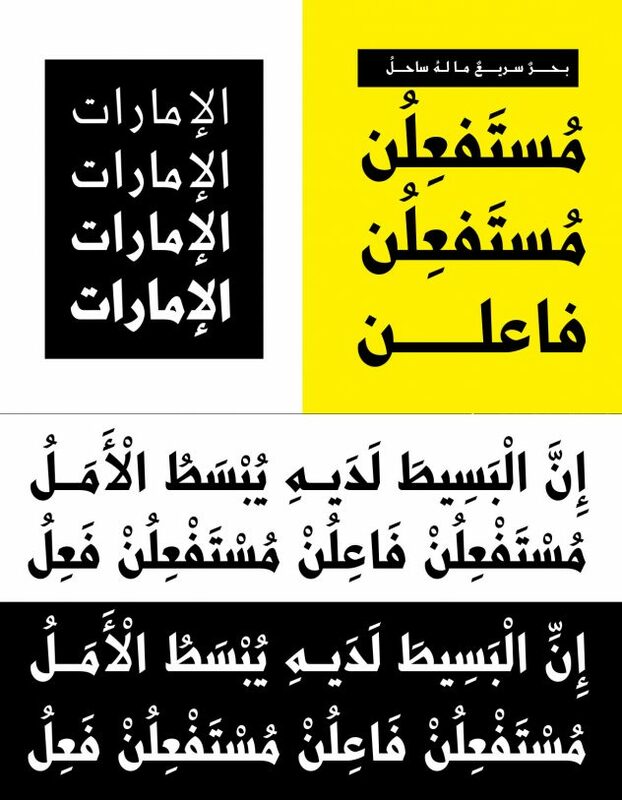 This ongoing project keeps the initial goal of celebrating the work of Muhyedeen Al-Labbad and reviving some of his great and mostly unknown typographic work to a wider design audience. We always try to develop typefaces that tells stories. 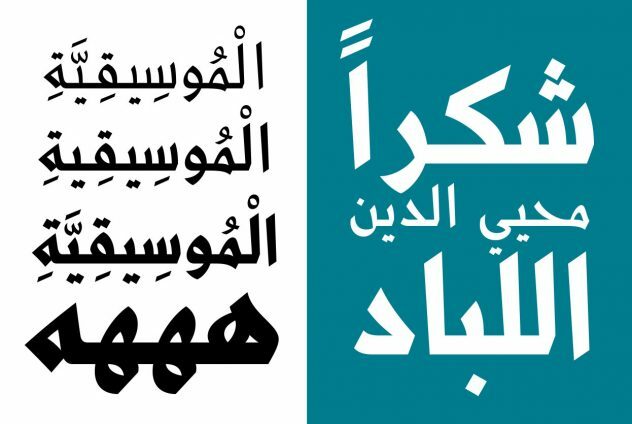 This typeface tells the story of a chapter of our mostly undocumented history of graphic design, while enriching the existing palette of Arabic fonts available today.